The Fellowship was fortunate enough to obtain a copy of DEADLY HARVEST from Arcana Comics. Erik Hendrix and Michael David Nelsen write, and Yannis Roumboulias draws. Meet Captain Layne and the crew of the Harvest Moon, a mining ship out on the edges of space. They’re about to get word of the biggest haul of their lives, and it just might turn ugly out there. It’s a long way from the nearest contact, and there are known to be pirates operating in the area. They’re a good crew, though, and they’ve gotten out of a lot of scrapes in the past. But maybe they can still be surprised. There’s a certain realistic feel to this book, despite the fact that it’s obviously science fiction. “Hard SF” is the term, and this book really captures the essence of it. The characters are real, and so are the situations; it could be drawn as a western just as easily as SF. (The weapons and ships are way cooler this way, though.) For that matter, it could also be done as a “Firefly” script. It’s gritty and harsh and cold and that makes it very likable. I really like this book; it’s good hard SF with lots of action and even some intrigue. Likable characters and some great landscape shots make for a happy reviewer. 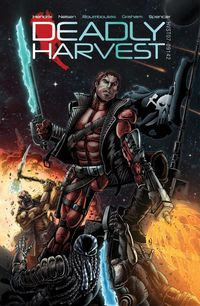 DEADLY HARVEST is available now at your FLCS or by order from arcana.com.